Libertyville, IL - The Canadian National Railroad will be closing the railroad crossing on Peterson Road, west of US Route 45, for emergency repairs. 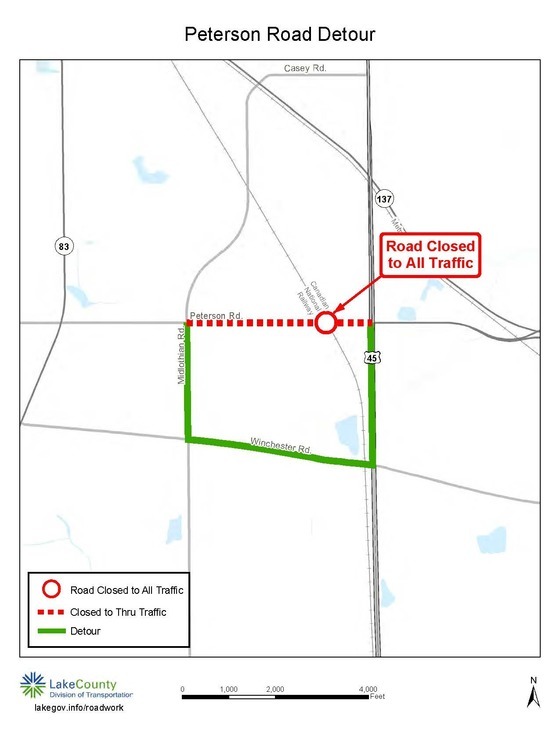 The closure of the crossing will begin at 7:00 A.M. on Wednesday, April 17. Peterson Road should reopen to thru traffic during the late afternoon of Wednesday, April 24. The signed detour route for this closure will be Midlothian Road to Winchester Road to U.S Route 45. Local traffic will be allowed from Midlothian Road to Franklin Boulevard and from U.S. Route 45 to Industrial Drive.